Adding vitamins and electrolytes for chickens in their diet is a good idea but you must be careful to come to a conclusion only after assessing requirements and understanding vitamins as a whole. Environmental factors also come into play, which is why talking to an expert before making a choice is a good idea. We all know that vitamin deficiencies can cause serious problems such as poor feathering, weakness, dermatitis, lowered egg production, and anemia. Ignoring them can lead to a lot of health trouble. 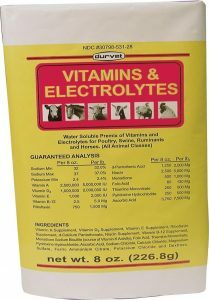 The Durvet vitamins and electrolytes for chickens formula comes in a convenient packaging, packed especially for chickens undergoing a lot of stress. It is water-soluble and can be used as a feed additive. You may also use it as a water additive based on preferences. You can feed this to poultry in a chicken feeder as well as livestock. It is among the few options out there that are reliable and affordable at the same time. A few users have reported that when added to water, the water needs to be consumed quickly because it tends to go bad quite soon. Completely natural, this formulation helps weak birds suffering from respiratory diseases. It also relieves them of cold, eye worms, etc. The formulation is helpful for chickens, ducks, geese, game birds, and turkeys. It helps prevent respiratory diseases. It is an excellent water additive. The product is safe for everyday use. In case a chicken is sneezing or suffering from cough, you could a drop of this in their nostrils to clear the problem right up. The product is easy and safe to use internally and externally. Formulated for weak and lethargic birds, the Net Tex drops are a good choice for chickens and other poultry birds. These drops boost immunity and help reduce stress especially when the feed absorption is stopped or disrupted. The drops can help the chickens maintain productivity. The is an instant energy formulation. Users have said that fowl are healthy and strong thanks to this product. This liquid feed supplement works to improve appetite and energy in chickens. It is a syrup-based product that consists mainly of phosphorous and iron. You need to add 10 ml to 4.5 l of drinking water. You may also dilute 5 ml of it in 100 ml water and add this solution to the mash. It also contains manganese and copper. This is a strong mineral supplement for poultry and contains zero chemicals. It is a mix of spices and minerals that has proven to help weak birds. 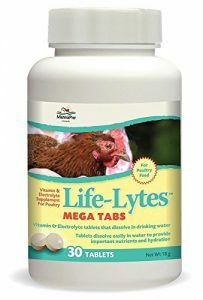 The supplement needs to be added to the chickens’ feed. 1 heaped 5 ml spoon is enough to feed 10 birds once mixed in their feed. It works to improve overall performance and health of chickens. Besides chickens, the supplement can also be used for ducks, geese, game birds, and turkeys. It has 16% protein content. 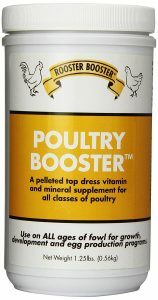 Suitable for fowl of all ages, the Rooster Booster Poultry Booster contains minerals, vitamins, and amino acids that are required to raise healthy fowl. The product is rich in calcium. It is good choice for growth and egg production in chickens. Remember that this is only a nutritional booster and not a worm killer. You can feed this to the chickens thrice a week or everyday based on the requirement. Make sure you read the use instructions on the label before you mix it into their feed. Many users have noted that the chickens are healthier and more productive after being introduced to this feed. To be used in chicken waterer, these tablets are rich in vitamins and electrolytes. They are ideal for better health for poultry since they contain all the required nutrients especially in terms of stress. 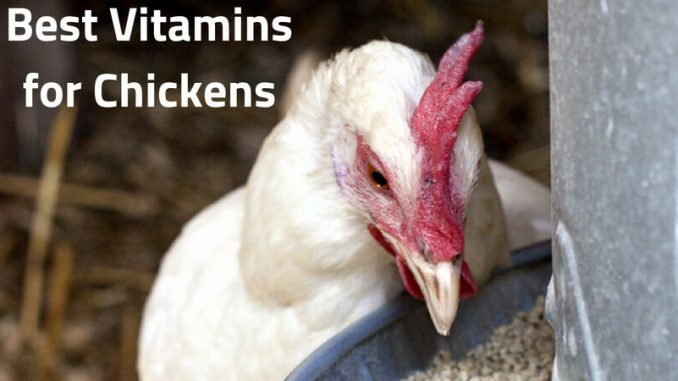 Along with vitamin A, vitamin D3, and vitamin E supplements, these tablets contain magnesium sulfate, potassium chloride, ascorbic acid, and other vitamins important for fowl’s health and maintenance. It is perfect for lethargic birds and birds who are undergoing stress due to weather changes. They are easy to measure and mix but some users have reported that the tablets are not melting fast enough. Many users have said that these tablets are their chickens’ saviors during the hot days. As you can see. All the vitamins and electrolytes for chickens have different purposes and serve different reasons. Based on the environmental conditions of your chicken coop, housing, and stress that chickens go through, you may pick the right one. As aforementioned, we also strongly advise you to take professional advice before making a choice so that you don’t make the wrong one!